While the World Climate coordination team was busy organizing events in Africa, our volunteers have kept running their own simulations. World Climate would not have had the success it has without the dozens of people around the globe who are using the tools to reach hundreds each month. Bindu Bhandari, World Climate Ambassador, Bhâratpur, Nepal. “As a World Climate Ambassador and Asia Regional Officer for the Cop In My City project, I organized a series of Training of Trainers (TOT) in Nepal. The first TOT was organized at the Agriculture and Forestry University (AFU), Chitwan Nepal involving 41 young people. The second TOT was organized at the Institute of Agriculture and Animal Science (IAAS), Paklihawa Bhairahawa engaging 32 participants. The third TOT was organized at IAAS Lamjung Campus with 43 participants. Most of the participants in the TOTs were undergraduate students from diverse academic background like veterinary science, agriculture science, environmental science, forestry, fisheries, journalism etc. All the TOTs adopted more or less similar format and ran for approximately 2 hours each. 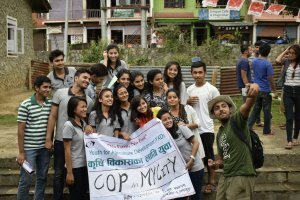 Youth participants were trained on how to organize COP In MyCity (action project of Climate Interactive partner organization CliMates) based on three phases of training, simulation and mobilization. Special focus was given on the use of C- ROADS (scientific computer based simulation) during the World Climate simulation. During the debrief session, there was a question and answer session whereby participants put forward their queries. Constructive feedback was obtained from the participants according to which they found World Climate to be an efficient tool for involving youth in mock diplomacy and advocacy of international climate negotiations. Students from non-science academic background said the procedure was a bit tough to understand, whereas students from science background didn’t have much difficulty in use of C-ROADS. Steve Kaagan, World Climate Ambassador, Asheville, United States. 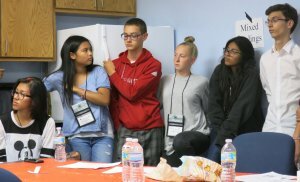 “On a Sunday in late June twenty plus teenagers, sons and daughters of US Navy personnel based in Japan and Spain, began a week of immersion in Science, Technology, Engineering and Mathematics (STEM) Workshop aimed at engaging their interest in these fields. Still jet lagged, their very first session was two and a half hours playing World Climate. The hope of the organizers was that the simulation would be a memorable and fitting start to the week. And further that the experience would be so engaging it would be an antidote to jet lag. Although my bias shows through, I believe these objectives were well met. Predictably, participants were slow to jump into negotiations in the first round, but made up for it in the second. I gave them enough of a break between rounds 1 and 2 that they were able to do what real negotiators do, make a number of deals outside the room. The gist of their informal between rounds of discussions was that they would seek mutual cooperation among all six groups to see if they could attain the 2 degree Celsius threshold. While they were only able to tether global warming to 2.5 degrees Celsius there was a sense, albeit tentative, of accomplishment. In the debrief that followed only a few expressed hope or despair. Most had mixed feelings about the result.